European kitchens are known for clean lines and noticeable contrast. This kitchen is streamlined and architecturally pleasing due to contrast. It is popular in Europe to choose brightly colored finishes for cabinets. These kitchen designs are highly effective. Generally in Europe space is limited, therefore the design needs to be highly efficient. Notice the design in this kitchen is particularly efficient. All of the cabinets and appliances are on the one long wall. Using the entire back wall for cabinetry and appliances is how this kitchen maintains an efficient design. 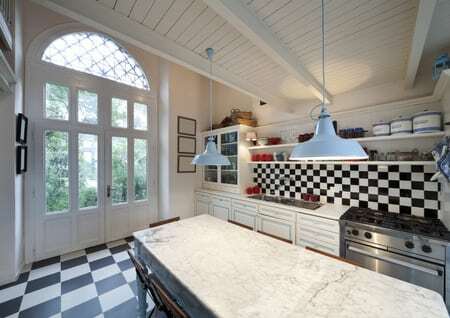 The adjacent island keeps everything within reach, yet the feel of this kitchen is open and airy. When the cabinets, sink, and appliances are all within an arm’s reach, it makes it super easy to maneuver around. Cooking and prep work is done all in the same vicinity. By not having to walk from one side of the room to the other, makes it easier to do these separate tasks. The high contrast between black and white make this kitchen visually appealing. There is an architectural aesthetic when black and white are used together, and the best place to start this motif is with black and white contrasting tile. Match the tile pattern to your personal style; large format alternating tile for a classic style, randomly patterned mosaic tile for a more casual feel or rectangular tile with a herringbone layout. This will help the built-in features of your home stand out and your personal style shine. A large island does double duty, by providing more work space, and providing an eat in area. Prep can be done on one side of the island, and meals can be served on the other side. European styled kitchens are all about bold finishes, clean lines, and efficiency. They intend to look more contemporary in style. This particular style works great in smaller spaces. The finish on cabinets works great for easy cleanup. This style may be just what your lifestyle needs!